The Accurate fixed blade from Ruger Knives is a hunting-specific knife from designer Bill Harsey. Available in trailing point and drop point blades, choose whichever you prefer and know that you've got one of the best knives at your side for field dressing and all-things hunting. 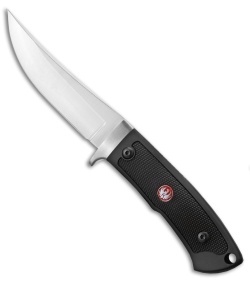 It has a satin finished guard and black grippy rubber over-model with an inset Ruger medallion. Included with this designer fixed blade is a reinforced nylon sheath. I've now had this knife for nearly a year and a half. The size, blade shape and grips make it ideal for most hunting tasks. Especially with the over molded rubber grips that are textured and easy to hold on to when hunting tasks get grimy. The blade holds a decent edge and is easy to clean and sharpen. My only gripe is with the included sheath. Its open top design makes it possible to lose the knife, when hiking in brush etc. It is light and fits OK, but some sort of retention would be suitable for a knife designed for hunting. Overall, the Accurate is easily worth the prices they are going for in retail.